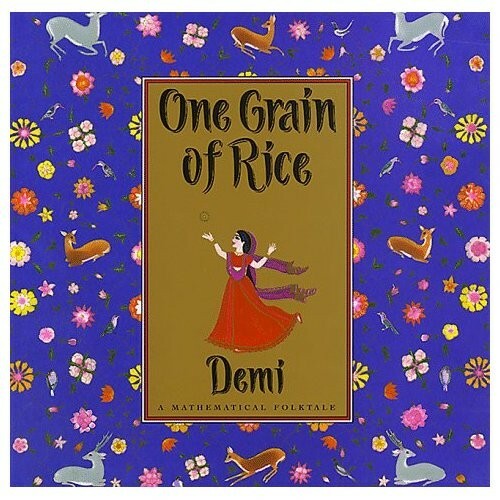 Exotic, beautiful, and instructive, this "mathematical folktale" by author-illustrator Demi emerged from her love of India. The narrative and the evocative illustrations combine to create a real sense of the culture and atmosphere of this romantic land. It's the story of Rani, a clever girl who outsmarts a very selfish raja and saves her village. When offered a reward for a good deed, she asks only for one grain of rice, doubled each day for 30 days. Remember your math? That's lots of rice: enough to feed a village for a good long time -- and to teach a greedy raja a lesson. Artwork inspired by traditional Indian miniature paintings - including a four-page gatefold - is "visually striking." -- Publishers Weekly.